You can return a product for up to 28 days from the date you purchased it. Condition must be New and Unused. The original shipping charges are not refundable. Customers are responsible for the shipping cost of returns and exchanges. with a new shipping charge. Returns Address: Please email us for a returns reference number and we will advise which warehouse to return to. “Client”, “You” and “Your” refers to you, the person accessing this website and accepting the Company‟s terms and conditions. “The Company”, “Ourselves”, “We” and “Us”, refers to our Company. “Party”, “Parties”, or “Us”, refers to both the client and ourselves, or either the Client or ourselves. We are committed to protecting your privacy. Your Contact Details are not passed to any third party. No credit card details are stored on this website. 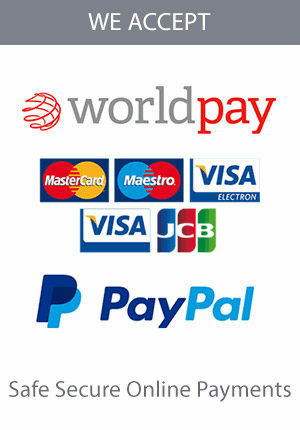 All major Credit/Debit Cards plus payments through Paypal. Our Terms are payment in full before goods are shipped. Unless otherwise stated, the services featured on this website are only available within the United States. All advertising is intended solely for the United States market. You are solely responsible for evaluating the fitness for a particular purpose of any product. Redistribution or republication of any part of this site or its content is prohibited, including such by framing or other similar or any other means, without the express written consent of the Company.